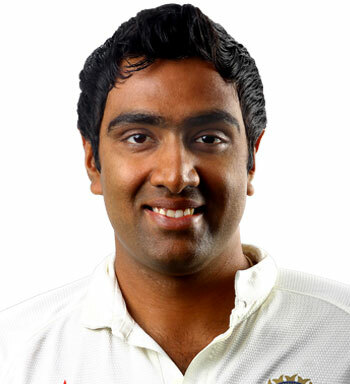 Ravichandran Ashwin (born 17-Sep-1986; Madras, Tamil Nadu) is an all-rounder right-handed batsman and right-arm offbreak bowler, who plays international cricket for India. He made his International debut in ODI against Sri Lanka at Harare on Jun 05, 2010. 27-Nov-17: Ravichandran Ashwin became the fastest to takes 300 wickets in Tests, he break Dennis Lillee record who took 56 Tests to reach same landmark. 12-Feb-17: Ashwin gets to 250 Test wickets in 45th Test, he's the fastest to the landmark. 25-Sep-16: Ravichandran Ashwin became the second fastest bowler to claim 200 Test wickets and fastest by Indian, achieving the milestone in his 37th match. 14-Nov-13: Ashwin has become the fastest Indian bowler to take bag hundred Test wickets during the second match against West Indies at the Wankhede. 08-Nov-11: R Ashwin's magnificent figures (6-47) are the third best in an innings by a bowler on debut for India, next only to Narendra Hirwani (8/61 and 8/75) against West Indies at Chennai in 1987-88. He declared man of the match on debut for nine wickets in the match.